Headed to a Tri-City ValleyCats game? We’ve got prizes for you! The ValleyCats have wrapped up home games for the 2013 season, and therefore this contest is closed. Congratulations to winners Richard, Haley, and Jess! If you haven’t noticed already, we like contests and giveaways. We also love summer and baseball, and for that reason we’ve come up with a great opportunity for you to win some cool prizes. Saint Rose banner in the outfield of 2013 ValleyCats home games. What is our ValleyCats contest? This contest is pretty simple. Next time you’re at a ValleyCats game, snap a photo of the Saint Rose banner in the outfield. 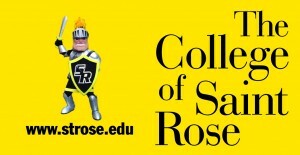 Share it with us via the Saint Rose Facebook page or tagging us on Facebook, through Twitter/Instagram with @CollegeofStRose, and you’re entered! As long as your share is public, we will see it. What could you win? For this contest we’ve got some pretty great prizes. 1st place: Saint Rose backpack, baseball cap, Golden Knights sweatshirt, AND a “coaches level” Golden Knights Club membership (which includes two season tickets for regular-season Saint Rose men’s and women’s home basketball games!). P.S.- When summer is over and you’re in need of more sporting events, check out the Golden Knights website for more games to attend! I just went on 7/5… Guess I’ll just have to go again!! !